Let’s have some plumbing fun. The drain should come with everything you need for installing, except for plumbers putty. 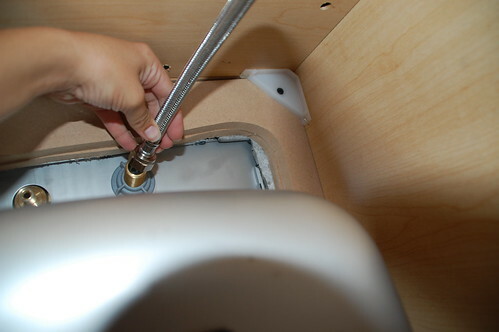 Then put the top part of the drain on and tightened it down using the rubber washer, fiber washer, and nut (in that order). 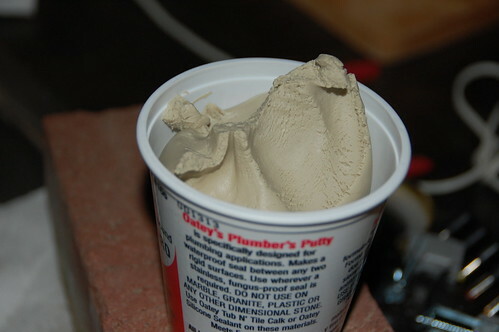 When it’s good and tight, the putty will have smushed out of the top a bit. I used a utility knife to trim away the excess. Then connected the P-trap to the bottom of the drain. Both the drain and the P-trap came with compression nuts for this part, and the P-trap came with a small plastic washer. I used the plastic nut that came with the P-trap because it didn’t require a wrench. There were plastic “tabs” I could use to hand tighten. And that’s all there was to putting in a new drain. 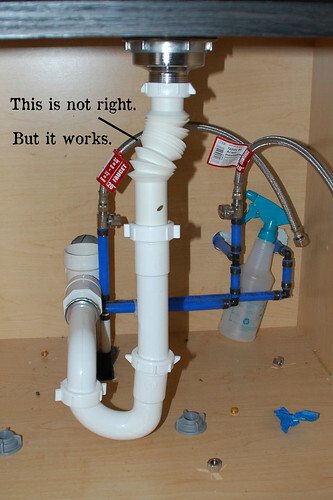 Also, this is not a picture of the way your under-sink plumbing should look. After the rough plumbing was in we decided to keep a door opening next to the sink and that changed all of our cabinet widths, resulting in some, er, creative plumbing on my end to get the drain attached. Plumbers, I’m sure you all just cringed at that, but talk to me after you’ve spent weeks washing dishes at the water pump. It works, and that’s what I was most concerned with. Note the lack of accordion-pipes. Drains are easy. 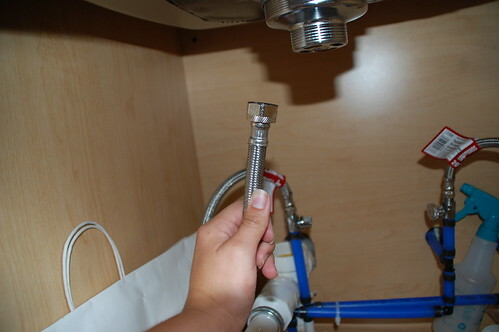 Faucets require more tools and more time contorted under the sink in back-breaking positions. 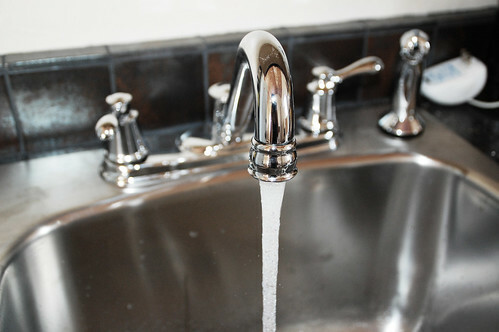 If you need to remove the old faucet, shut off the water supply (there should be two knobs– one on each pipe that leads up to the faucet) then there’s probably some investigative work to do on how to detach those pipes– usually a nut at the top, connected to the faucet– and then how to disconnect the faucet itself. 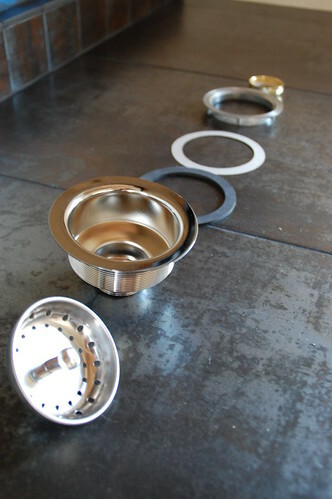 It will likely be held in place with nuts under the sink, or covered bolts on top of the sink. 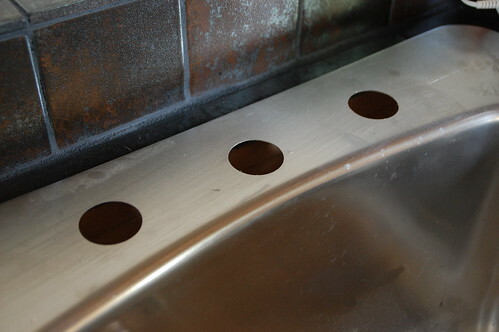 Sinks come with two, three, or four pre-drilled holes. 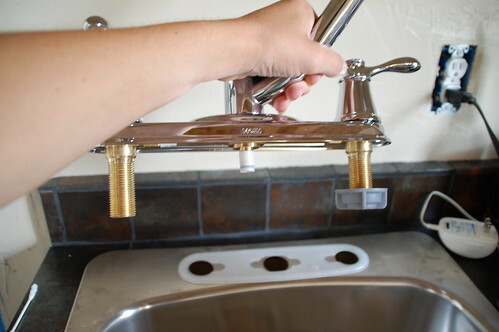 Most faucets come with a plastic gasket that goes between the sink and the faucet. If it doesn’t here’s another place you can use a snake of plumbers putty. This faucet is held under the sink with a couple of nuts. Here are all the components. There are also faucets that mount with bolts on the top, which is something you may want to consider, because otherwise everything that happens from here on out is going to require wedging yourself into tiny little spaces and working with no blood left in your fingers. 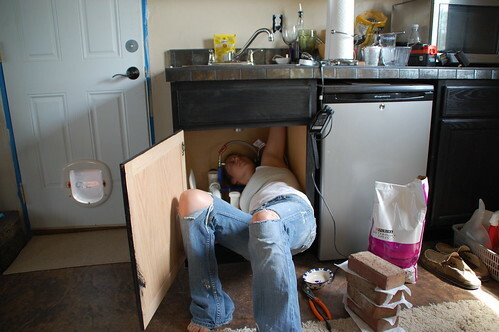 Much respect to plumbers who do this day in and day out. I don’t know how. The nuts are attached and hand tightened. Then, if you have flexible piping from the hard line, it’s fairly easy to bend and attach. Plumbers, feel free to disagree, because I had a serious internal debate about whether or not to use plumbers tape on these threads. I went with not, and tightened them down real well with an adjustable wrench, which was no small feat. After a couple of tests where I determined there wasn’t the littlest bit of leakage, I decided “not” was the correct answer. 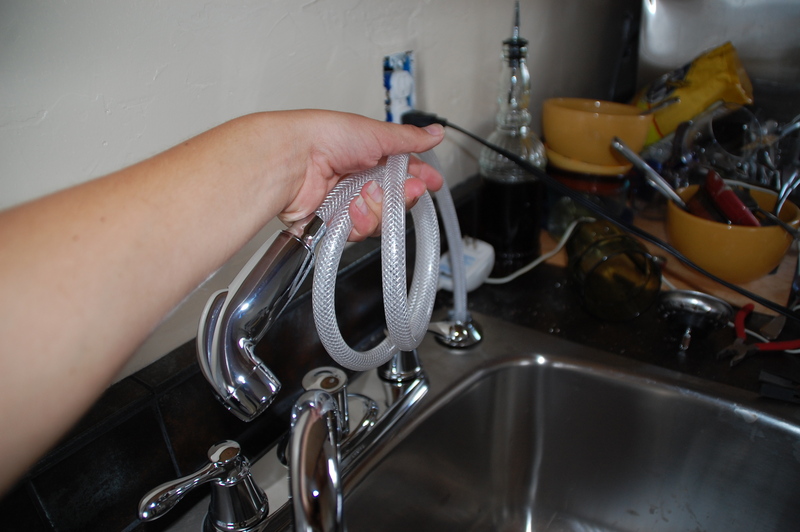 …and attached to the middle part of the faucet (directly under the spigot). All in all, a simple DIY project. 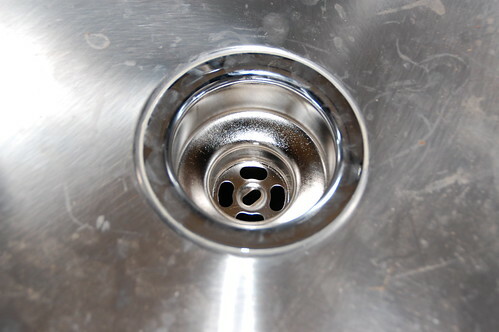 Got any tips for changing faucets, drains, or fitting into that tiny little space under the sink? I’d love to hear ’em. What was the pile of bricks on the floor for? You did a great job explaining it! We always do our own faucet, shower, stuff. Luckily it’s usually my husband who does it, so I get to just help. 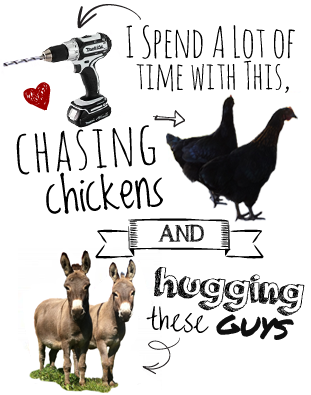 Having two people seems to make the job a whole bunch easier. 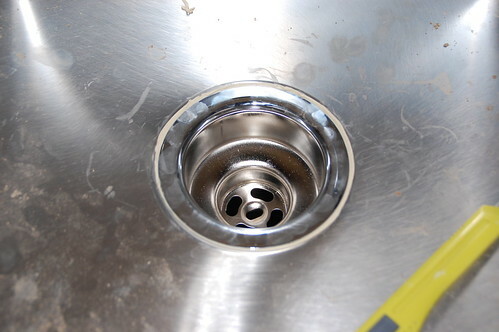 you could have installed the faucet in the sink before you set the sink in place, thus eleminating the tight area to tighten it down in under the sink. What do you think would have happened if you had used plumber’s tape on the threads? I’m groaning as I see that nice plastic gasket under the escutcheon and consider the existence of plumber’s putty. We didn’t have either when we (meaning a friend of mine) installed my new sink faucet two years ago. I tried a bead of clear caulk, but it looks like hell and it’s coming up, besides. 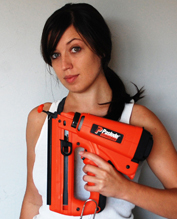 Get a socket wrench, long extension and deep socket–that’s what I use instead of the plumber’s wrench. long extensions are a lifesaver to any undersink plumbing work! 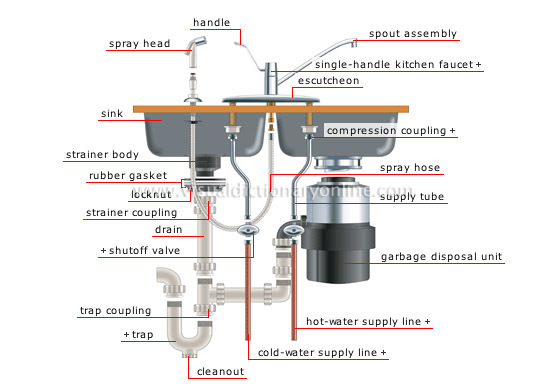 In the graphic that shows everything under the sink, it appears the horizontal pipe before the trap is lower than the pipe after the trap. Would that cause any draining problems? Thanks. I was surprised that plumbers tape was not used. I will be installing a replacement faucet and had planned on using the tape. any thoughts? Also, should I use putty or silicone caulk up top to secure the faucet onto a Granite counter top? I had heard that plumbers putty would adversely react to Granite. Any suggestions? Do you need to use caulk or putty around or sorrounding the sink when you put it in to stop water from seeping in the side of it? Its good as your other content : D, regards for posting . “To be able to look back upon ones life in satisfaction, is to live twice.” by Kahlil Gibran. you are an expert on this subject. Well with your permission let me to grasp your feed to keep updated with drawing close post. on-line and really liked this excellent variation. class. Thanks for helping me with the conclusion of my report. that you will definitely obtain pleasant experience. For organization you might change this unique style for a thread rack. Seems to help in artistry and also craft rooms. You were capable to save money when using the free install that Home Depot special offers on purchases about $1500. 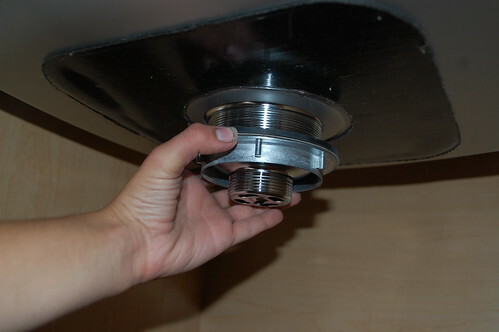 In plumbing, there are two types of threaded connections: those that require a seal such as teflon tape or paste; and those that don’t. The latter has become much more common. They have some sort of ring or gasket that makes the actual seal, and the thread connection merely provides the force to clamp that together. 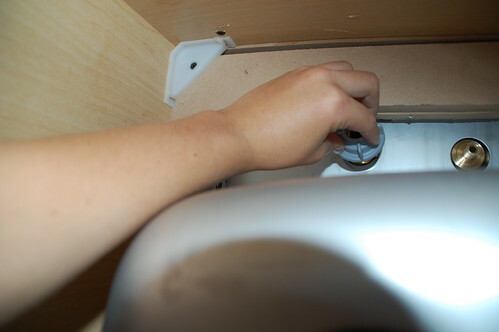 Examples are garden hoses, washer hookup hoses, copper flare connections, and toilet or sink flexible hookup lines (between the shutoff valve and the sink or toilet tank). A little bit of lubrication is helpful on the threads to aid in a tighter connection. Vaseline is good, white lithium grease is best. 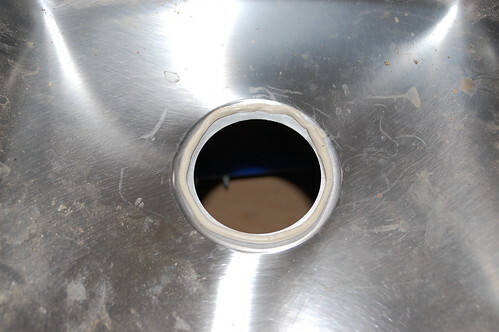 The types that do need a thread seal are any NPT threads – National Pipe Thread fittings, found in galvanized water pipe, black iron gas pipe, and many brass, copper, or PVC fittings. These are becoming much less popular in favor of PEX tubing and threadless connectors. Thank you for explaining everything in detail and for posting pictures of every step. I actually feel like I can do this. Thanks for sharing! I always enjoy reading your blog, you are full of useful ideas, and you are incredibly handy. Your tutorials have saved me hours of trying to fix various things around the house, so thank you!